With improved offensive consistency, KCP could develop into one of the league's top two-way guards. As it stands, he probably ranks in the league's top-10 on-ball defenders. I like KCP a lot. You should too. Brandon Jennings completely ignored Thabo Sefolosha who was standing unguarded in the lane when KCP intercepted the pass. KCP was thought to be the floor spacer that the Pistons needed, a role which he was disappointing in (about which, more later). However, plays like this one and his nonstop defensive presence are what will keep him in the league regardless of his shooting prowess. The ability to stay in front of the league's foremost athletes, force bad shots, and single-handedly generate turnovers is a skill few possess. KCP is a special defensive talent with room to improve offensively. Finishing. Though the above video is mostly KCP eating the summer league for lunch, there are a few dunks in there that became indicative of his abilities at the rim. 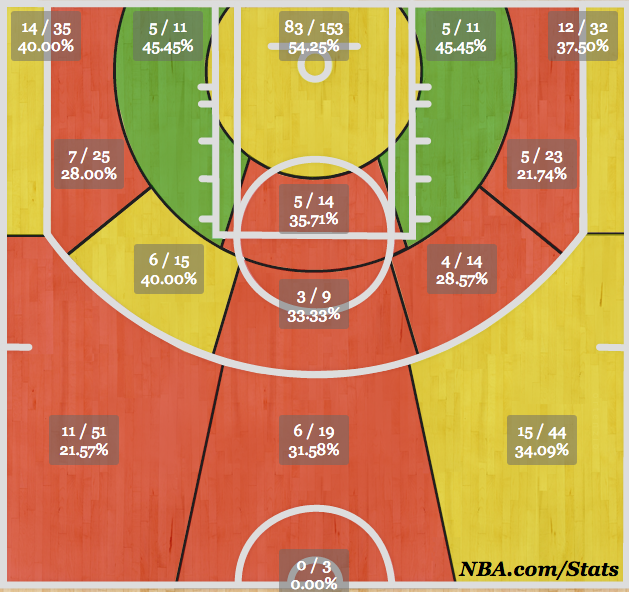 Though he improved throughout the season, KCP became notorious for missing shots at the rim. Much of this had to do with his slender frame and its subsequent influence on his ability to play to contact. When driving to the rim, he actively tried to avoid contact, which is something a player of his skillset should not do. Though he finished somewhere around league average at the rim, if you extract the fast break dunks, that number likely drops below league average. It's yet to be seen whether or not he can finish through contact or draw the kind of contact that earns foul calls. But if he's not going to play to contact, he will need to improve his ball skills around the basket. Shooting stroke. Make no mistake: there is nothing inherently wrong with KCP's shooting stroke. It is, however, very slow. KCP struggled all season on late contests from defenders because his shot takes so long to get off. When he's wide open, he sets himself and is able to shoot with some consistency. He does so with his lower body, emphasizing the bend in his knee. (This is one of the reasons that he's better off the dribble than on catch-and-shoot, because he's able to rock himself into rhythm.) But when he's forced to shoot quickly, as was often the case in the Pistons' half-court set--issues also arise in this evaluation because the team was so bad at getting outside shooters open looks--his shot was erratic. Because of the length of his shooting motion, there are lots of opportunities for his mechanics to fail him. This summer will be very important in his development and a necessary time to work on his shooting form. Rhythm. This could just as easily be put under his strengths, but because KCP so rarely got into rhythm, it'll go here. Never have I seen an NBA player so affected by his involvement (or lack thereof) in a game. Earning the starting nod to begin the season was the right move, least of all because it got the Pistons' best five players on the court. KCP struggled with the speed of the game at times early in the season, and after benching him midway through year, asking him to enter games for 5-minute stints to take contested 3s late in the shot clock never ended well. In college, KCP was a major ball handler and was deeply integrated into the offense. During his rookie season, he was often put in a corner and asked to stand there as a decoy with no intention of getting him the ball. This lack of constant involvement in the play had a negative affect on his output. It is no surprise that his best game of the season came in the finale against Oklahoma City when he was given the starting nod and handed the keys to the offense. That performance can either be seen as a major outlier or evidence of his potential when properly used. I favor the latter. The problem is, he will need to get better as a low-usage spot up shooter if he's going to succeed with this team. Even if SVG doesn't implement the Orlando Dwight Howard offense (4-out, 1-in) with the Pistons, Jennings, Drummond, Monroe, and Smith are all more ball-dominant players than KCP. KCP is a prototypical 3-and-D player in the NBA. As an elite defensive stopper, he'll always have a place in the league (see: Tony Allen). 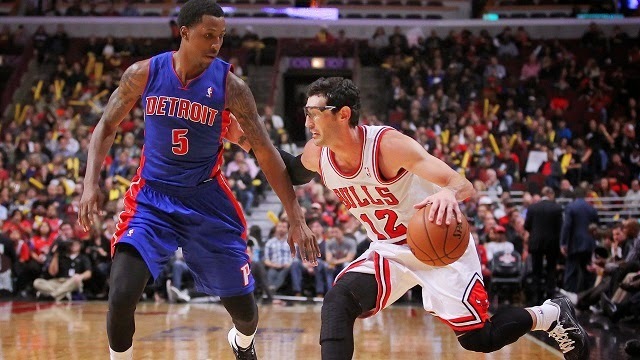 If he can shore up his outside shooting, he could be an invaluable asset for the Pistons. He doesn't project to being the focal point of an offense, but he could easily give the team 15 points/game with the occasional outburst. This summer will be telling. Without Andre Drummond in the Summer League, KCP will take center stage as the team's top prospect (with apologies to whoever they take in the draft). If he shows improved mechanics and more consistent scoring capabilities, the sky is the limit.